The bag hanging from her shoulder bounced a little against the velvety fuzz of his leg, and he wriggled. Her short arms loosened around his leathery wings, and the bag slid down to her elbow. “No Douglas,” she said, her lower lip puckered out in a focused frown. “Have to be patient.” She half dragged the creature and bag across the grass until they reached the center of the yard. The little girl set Douglas down on the grass, and he poked his overlarge head through the crook of her arm as she dug into the bag. She giggled and took out a neon yellow tennis ball. Douglas chirped and hopped up and down on his mismatched feet and winged arms, his long tail bouncing like a tiny red flag behind him. The little girl’s face lit up in a smile of little pearls, and his eyes followed the ball as she held her hand up. She threw the ball, and he raced after the neon yellow orb like a dog after a squirrel. He was really fast for an animal with wings for front legs. Every time the girl threw the ball he darted after it, using his flag of a tail and an outstretched wing for sharp turns. Again and again she threw the ball, and sometimes he’d catch it in midair with his needle sharp teeth. Then she clapped her hands and screamed with glee, her curled pigtails bouncing. The next time she threw the ball, it dropped a few feet from her and rolled through the soft ferns and moss. Douglas caught it just before it rolled past a thin pine tree, but dropped it as soon as the little girl reached into her bag again. He scampered to her side just as she pulled out her hand with something in her closed fist. It was small, wrinkly, and looked a little like a stick. Oh, oh, oh! Douglas chirped and jumped off the ground with his wings into a soaring leap. The little girl squealed in both delight and terror as the outspread wings and sharp little teeth soared up towards her hand, and she tossed the treat quickly towards him. Douglass caught it in midair and landed at her feet with folded wings, swallowing the treat with a quick backwards jab of his head. The little girl carefully picked up Douglass around his wings and middle, his legs dangling. She left the empty bag laying in the ferns and grass, and a yard full of tennis balls behind them. Can you spot what’s different? Say hello to a new babysaurus on the way! The egg will hatch next summer, so I’m still pretty early in the pregnancy, but I’m through the roughest part and feeling good! With everything so busy with the move, and the unpredictable nature of early pregnancy, what little time I usually carve out for art has been used for much needed naps. I thought carrying my sketchbook with me everywhere I go would at least help in getting a few sketches for Instagram, but if you follow me and haven’t seen anything…clearly that plan didn’t quite pan out. Well the critters I can clean up a little more and make more items for Redbubble. I really like my mug and my phone case, and someone actually bought an art bag with Ajax on it! So I’d like to make more of these, even if purely for my own enjoyment and collector’s value. It’s something that I can see and touch and use and say, “I made this” 😀 And I can really enjoy using it because I made it. The short stories I can clean up, polish, and publish in little collections. Again, it’s something that I can buy, put on my shelf, and say, “I finished this. It’s real” 🙂 Being able to see those books on my shelf would be all the encouragement I need to keep chipping away at the picture book. Plus then I’d have something to start sharing at my library or with people who are interested. I would include little sketchy illustrations with the short stories. A bit like the sketches I post on Instagram. Perhaps with the color illustration of the featured critter. I’m on the fence about including a few fast facts about the featured critters in the stories. Perhaps just a quick info page in the back of the book, but I’d like to know what you think about that. 🙂 I’d love to here from you in the comments. < Critter of the Month? Now that you did Dimophodon, could you do Caelestiventus when you get to the Triassic? It’ll be a while before we get to the Triassic, since I plan on exploring the Cretaceous next. So many new discoveries are made every year that I’m not making any lists for time periods I’m not currently exploring until I get there. Ooh, ooh, and you added the little boy to the illustration! I think he looks good, though is it just me, or is his right arm and hand bigger than his left? Good job on those hands, by the way—I always find them hard to draw. I also noticed that you lightened the foliage. Is that so the focus is on the main characters, or is it for another reason? This is my favorite story by far! I love how you portrayed Douglas in the story! He’s so cute! 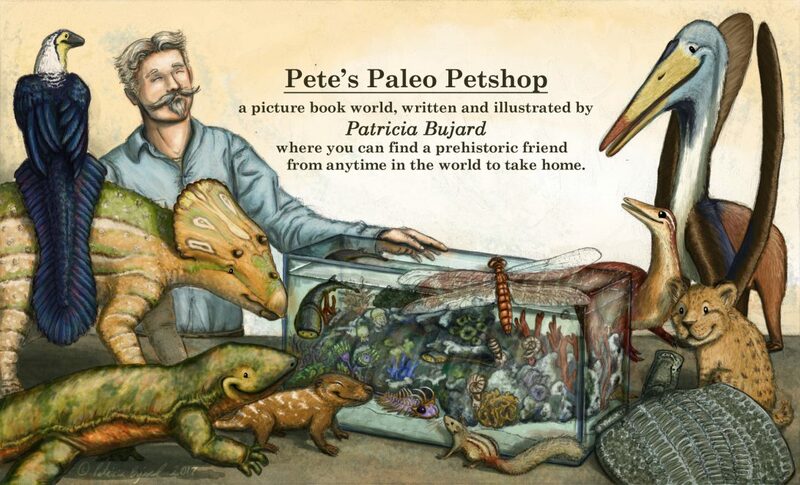 I also like the idea of a collection of small books for each critter, having facts about them will definitely help the readers know about the critter they are reading about, plus it will entice kids to read it. The next critter on the COTM train is Alfred! Well, I think it’s him.